Here are some extra clues which should help in your sightings adventure! If you look off headlands or off the mouth of a bay on a calm day you might see oily, sometimes frothy, slicks in the water. 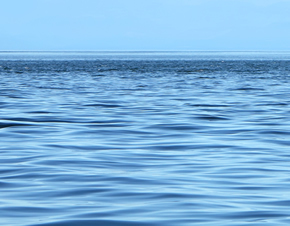 These tidal fronts occur where a warm water body meets a cooler one. Plankton concentrates here and so if you can identify a tidal front you should concentrate your binoculars here. 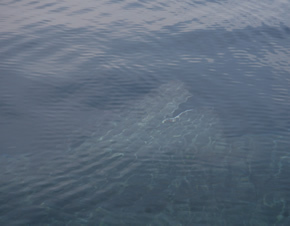 Basking sharks often feed in zig-zags through these plankton rich tidal fronts. At the base of Bradda Head the plankton sometimes piles up under the cliffs and a ‘vortex’ of plankton occurs. This means that the sharks swim in circles and zig zags through the rich plankton. The same happens on the Port Erin side of the Sound, near Kitterland where the currents swirl around and concentrate the plankton. This is a powerful indicator that basking sharks might be nearby. 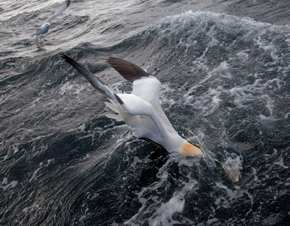 This is because if you see many of them diving in they are after small fish at the surface. The small fish are after the same plankton that the basking sharks are wanting. The almost black dorsal fin of the basking shark is very flexible. If it is a sunny day the sun reflects off the fin like a flashing mirror. Watch for this. It is a common occurrence to hear keen observers pointing excitedly at birds, seals, scuba divers, lobster pots, dolphins, whales or boats and shouting that they have spotted a basking shark. Shags and cormorants are the worst. When they put their wings up a characteristic cry is “It’s a sha—–ag”: tends to go up. This might cause amusement but it can be rather frustrating! IS THIS A SHARK? See examples below to help! Looking at the picture below you could be forgiven for thinking that it is a shark fin BUT if you look at the next picture you can see that it is a seal. 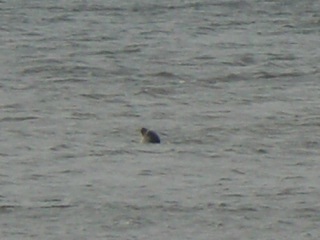 Seals often bob upright in the water whilst resting. It is called ‘bottling because they look a bit like a bottle bobbing around in the water. 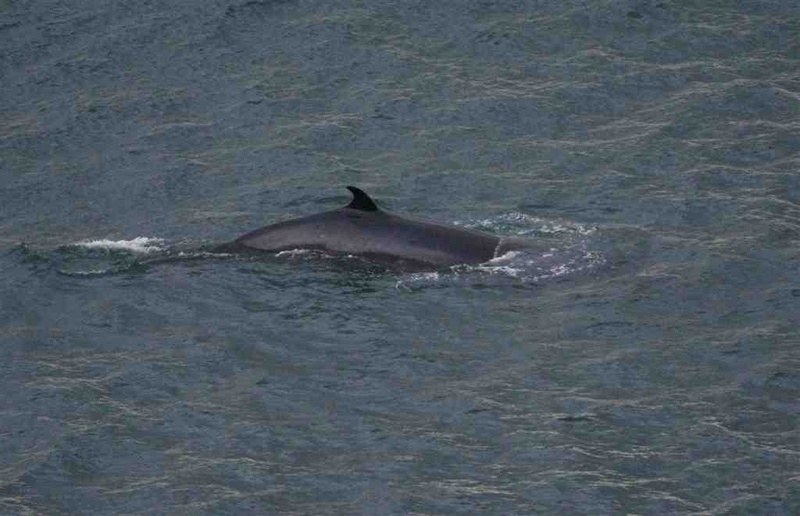 This picture of a minke whale was taken off the east coast near Dhoon Glen. The animals is much larger than a basking shark and the fin is much smaller in relation to the body size. 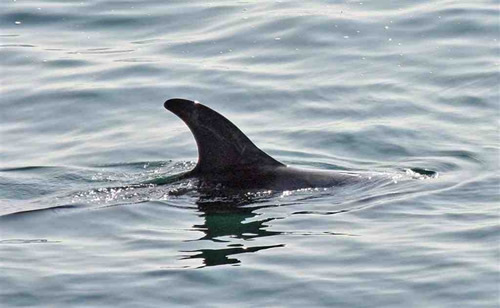 This Risso’s dolphin could be mistaken for a basking shark fin from a distance. Rissos photographed off Marine Drive Douglas. We DO get basking sharks there but very rarely and only at the very beginning of the season. Photo by John Donnelly. But the second photo of a Risso’s dolphin could not really be mistaken for a basking shark because basking shark leaps are far less elegant than this! 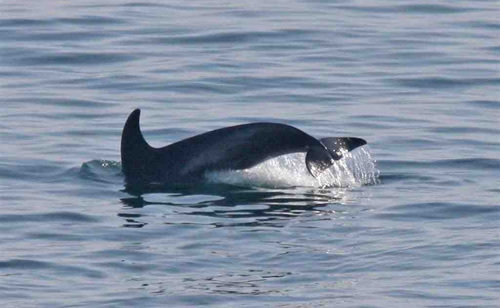 We also get some very charming small harbour porpoise, just over a meter long. On flat clam days you might see a fleeting glimpse of a small triangular dorsal fin slipping just above the water surface. 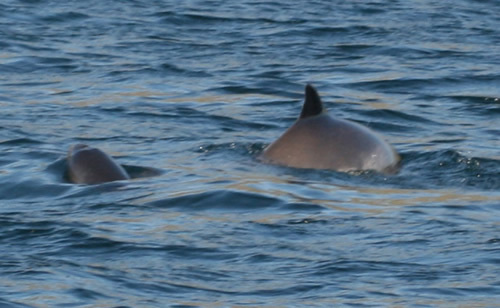 Here are some charming pictures of a mother harbour porpoise and her baby taken on the Port Erin side of the Sound June 2009 by Carol Manzi. Well done Carol, they are really hard to photograph. 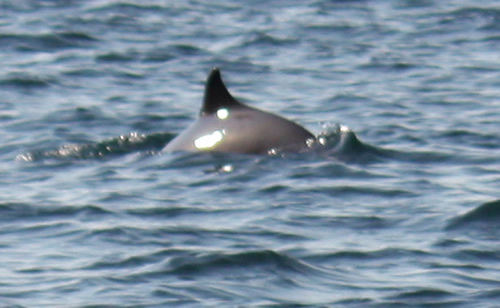 The ssecond porpoise photograph is another harbour porpoise taken on the same day, also by Carol. 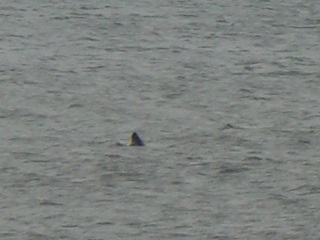 Yes, it’s a fin, yes it’s dark BUT it’s too small, too quick and bending the wrong way to be a basking shark! Basking sharks tend to bend and flex side to side, porpoises, whales and dolphins have arched backs.